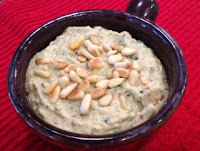 TheArmenianKitchen.com : Mama Ghanoush - a great name for a tasty appetizer! Mama Ghanoush - a great name for a tasty appetizer! 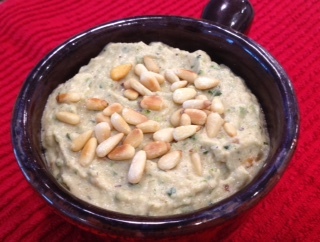 The Armenian Kitchen's Mama Ghanoush garnished with toasted pine nuts. Doug likes to browse through Middle Eastern restaurant menus online. One day he showed me an amazing menu, each dish sounding more incredible than the next. The one that caught my eye was 'Mama Ghanoush'. I don't know how it got it's name, but it's the zucchini version of the eggplant-based dish, Baba Ghanoush. Mama Ghanoush isn’t a new recipe, but I’d never seen it on a restaurant menu before now. Hoping the restaurant was nearby, I enthusiastically asked Doug its name and how soon could we go. 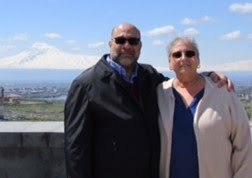 In a soft voice, he reluctantly stated, "The restaurant is called Batchig and it’s in, um, Lebanon." Lebanon?? Thanks a lot, Doug!! Right away I knew we wouldn’t be dining there anytime soon. 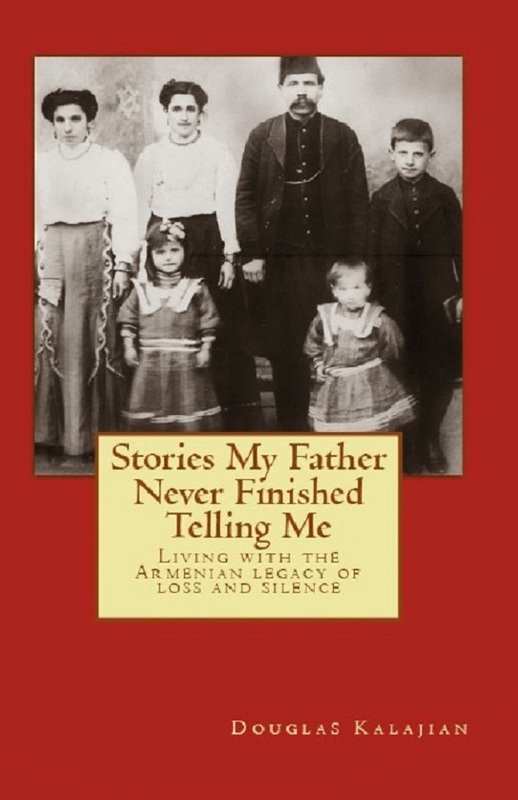 Special Note: Batchig means ‘kiss’, in Armenian. Coincidentally, a few days later, I saw a recipe on Face Book for ‘Mama Ghanouj’ – from Oh My Veggies website. I took this as a sign that it was time for me to prepare it. Garnishing options: toasted pine nuts, ground cumin, chopped parsley, za'atar, olive oil. Wash each zucchini and pat dry. Slice in half lengthwise, or, leave whole. Lightly oil the zucchini's surface. Oiled zucchini halves in a lightly oiled stove top grill pan. 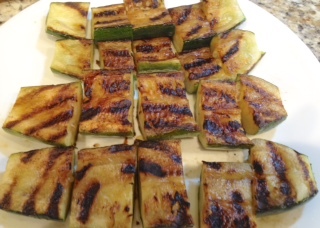 Place zucchini directly on the heated grill grates. Grill, turning from time to time, until softened and lightly charred. Grilling can be done on the stove top using a grill pan, or broiled in the oven, but, turn every so often so they cook evenly. Remove from heat and allow to cool. Slice off the top and the bottom off each zucchini and cut them into large chunks. In a small mixing bowl combine tahini, cumin, salt, garlic, lemon juice, and olive oil until well-blended. Place grilled zucchini chunks and tahini mixture in a blender or food processor and blend until smooth. Adjust seasonings, if necessary. Transfer to a serving bowl and drizzle additional olive oil on the top. Garnish with toasted pine nuts, additional ground cumin, chopped parsley, or za'atar, if desired. Serve with an assortment of fresh vegetable sticks, pita bread triangles, pita chips, or crackers.